Our Media Awards often yield a great crop of the best in human rights journalism, making the decision to select a winner and two shortlists a near impossible feat for the judges. Judging the Media Awards in 2016 was no different. The quality was supreme. The selection process was passionate. The judges’ decision, however, was final. 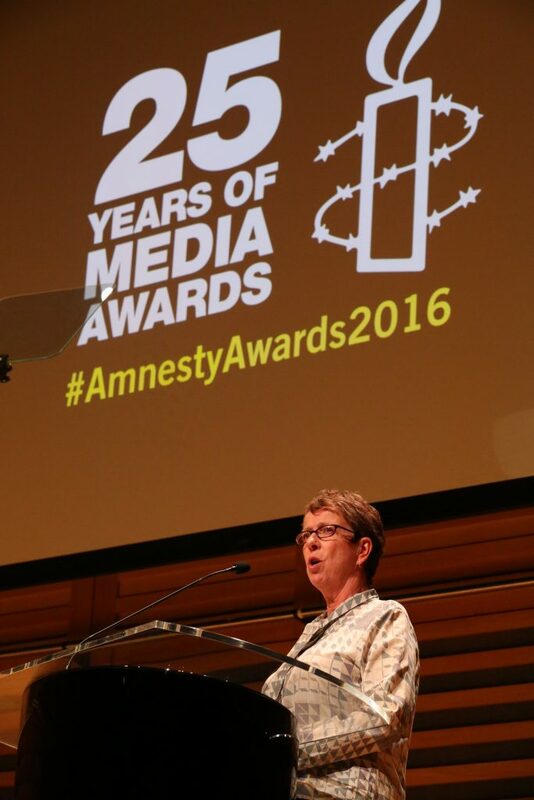 Amnesty International celebrated two of the UK’s best-known journalists for their dedication to human rights reporting at its 25th annual Media Awards ceremony in central London on Tuesday 29 November 2016. The Sunday Times’ foreign correspondent Marie Colvin – who, in 2012, was killed in an airstrike while on assignment in Syria – and BBC News’ correspondent Sue Lloyd-Roberts – who died of cancer in October last year – were each posthumously given a special Amnesty Media Impact Award that honours their courage and unwavering commitment to human rights journalism. Photojournalist and friend of Marie, Paul Conroy collected Marie Colvin’s award on behalf of her family while Sue’s husband Nick Guthrie picked up Sue’s award. 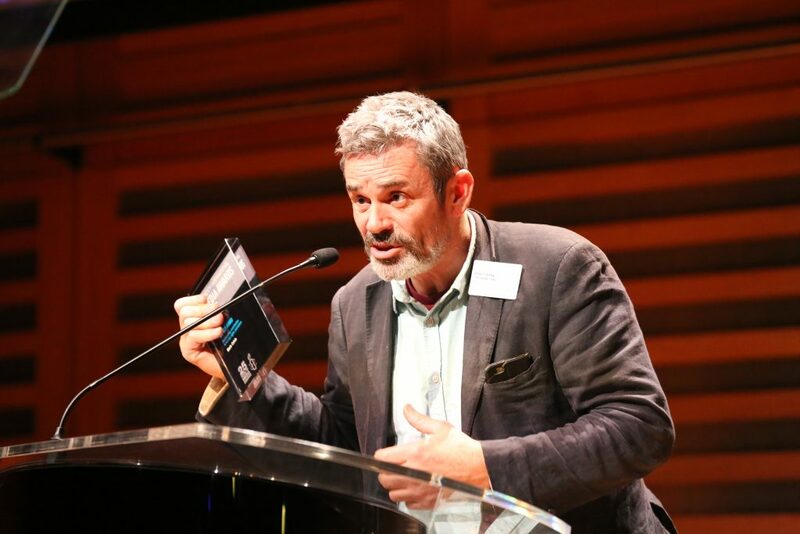 Paul Conroy collecting friend Marie Colvin’s Impact Award – Image copyright © Amnesty International / Nick Collett. Nick Guthrie collects wife Sue Lloyd-Robert’s Impact Award – Image copyright © Amnesty International / Nick Collett. Amnesty’s Media Awards opened with a short film featuring four award-winning journalists Alex Crawford, Victoria Derbyshire, Krishnan Guru-Murthy and John Simpson. Ranging from the downfall of President Alberto Fujimori amid a major scandal involving corruption and human rights violations to the first post-apartheid elections in South Africa, each shared their personal memories of the human rights stories which had the greatest impact on them over the 25 years. The Awards ceremony was hosted by Channel 4 News’ Foreign Correspondent Jonathan Rugman who stepped in with less than 24 hours’ notice to host as BBC presenter Emily Maitlis was unexpectedly sent to Havana to cover the death of former Cuban leader Fidel Castro. 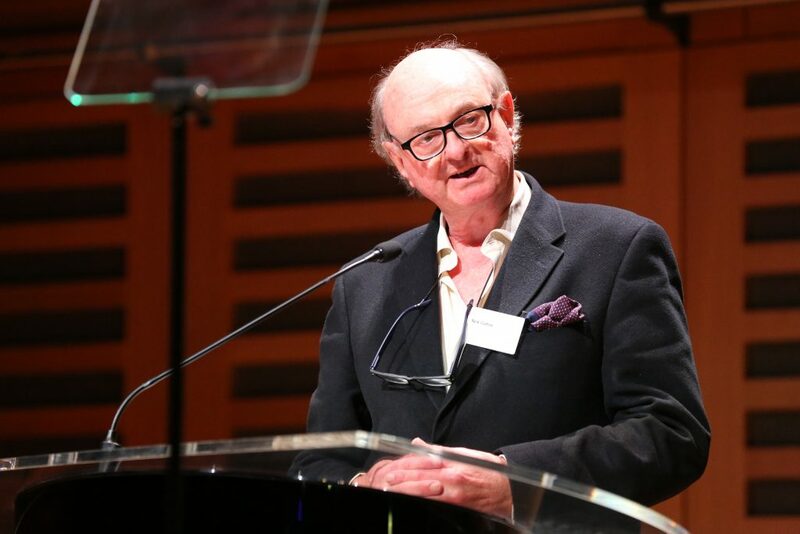 Meanwhile, the Sunday Times, The New Statesman, The Guardian and Channel 4 News were just some of the winners at this year’s Awards ceremony which took place at King’s Place in London. Syrian journalist Waad Al Kateab secured two wins – Television News and Gaby Rado Award for Best New Journalist – for her Channel 4 News report ‘Inside Aleppo: three brothers at al-Quds hospital’. Waad Al Kateab was unable to attend the awards, as she is currently trapped in eastern Aleppo. However, Waad sent a message which was read by Ben de Pear, Channel 4 News editor. “Maybe this will be my last letter to you and to the world. I am in the most dangerous city in the world and only today 30 barrel bombs and 100 artillery shells fell on my neighbouhood (Al Sukkari). I wanted to be with you but the siege of my city prevented that. I am just one individual of the 270,000 people who live under this siege. The only thing that’s available in this city is air, but this air, most of the time, is polluted with poisonous gases and chlorine. We are not the only city in Syria under siege and our salvation will not be achieved only by lifting of this siege or halting the bombing, but with the fall of the Assad regime and getting our freedom and dignity as Syrians. 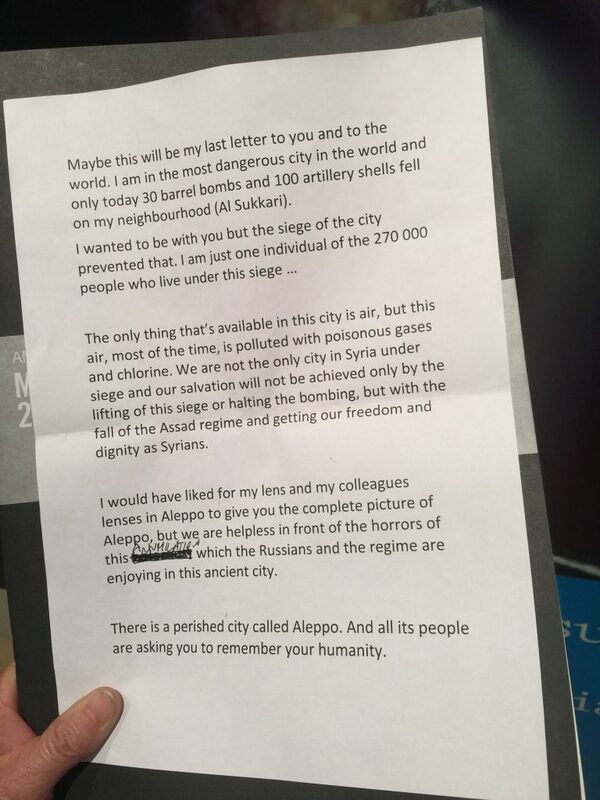 I would have liked for my lens and my colleagues’ lenses in Aleppo to give you the complete picture of Aleppo. But we are helpless in front of the horrors of this annihilation which the Russians and the regime are enjoying in this ancient city.